Dan Wilson ran for 158 yards and scored the game-winning touchdown to lead Louisville past Minerva 37-29. 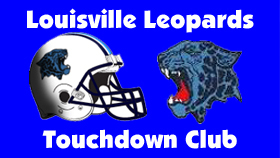 Jason Siegfried also scored 3 touchdowns for the Leopards. West Branch rallied with three consecutive touchdowns and held onto their advantage for a 26-21 victory over host Louisville back on October 28, 1994 in a game that decided the NBC. Dan Wilson broke the Louisville Single-Season Rushing Record in leading the Leopards past the Indians 42-2 with a 218 yard & 4 touchdown performance on the ground. The Leopards erased a 9-0 deficit with three smash mouth drives resulting in touchdown runs by Dan Wilson, Jamie Elkins, & Jason Siegfried to down the visiting Dukes 21-9. Ryan Crislip’s second touchdown run tied the game at 14 with 1:46 left, but the Bulldogs prevailed in overtime 17-14. Dan Wilson rushed for 162 yards for the Leopards. Dan Wilson ran for 173 yards and the only score of the game during the Leopards 7-0 win over the host Vikings back on September 2, 1994. A defensive stop before half was key in Louisville’s victory.